.. everything you want to know about animals is so close.. 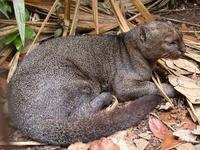 The jaguarundi (Puma yagouaroundi) is a medium-sized wild cat that ranges from southern Texas in the United States south to South America. The average length is 65 cm (30 inches) with 45 cm (20 in) of tail and a weight of about 6 kg (13.2 lbs). It has short legs and an appearance somewhat like an otter; the ears are short and rounded. The coat is unspotted, uniform in color, and varying from blackish to brownish gray (gray phase) or from foxy red to chestnut (red phase). The two color phases were once thought to represent two distinct species; the gray one called jaguarundi, and the red one called eyra. However, these are the same species and both color phases may be found in the same litter. Its coat has no markings except for spots at birth. 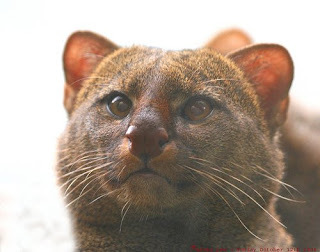 In some Spanish speaking countries, the jaguarundi is also called leoncillo, which means little lion. 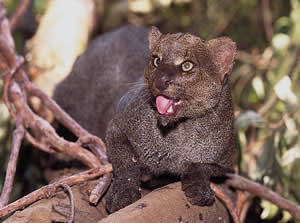 Other Spanish common names for the jaguarundi include: "gato colorado", "gato moro", "león brenero", "onza", and "tigrillo". This cat is closely related to the much larger and heavier cougar as evident by its similar genetic structure and chromosome count; both species are in the genus Puma although it is sometimes classified under a separate genus, Herpailurus and until recently, both cats were classified under the genus Felis. According to a 2006 genomic study of Felidae, an ancestor of today's Leopardus, Lynx, Puma, Prionailurus, and Felis lineages migrated across the Bering land bridge into the Americas approximately 8 to 8.5 million years ago. The lineages subsequently diverged in that order. Studies have indicated that the cougar and jaguarundi are next most closely related to the modern cheetah of Africa and western Asia, but the relationship is unresolved. It has been suggested that ancestors of the cheetah diverged from the Puma lineage in the Americas and migrated back to Asia and Africa, while other research suggests the cheetah diverged in the Old World itself. The outline of small feline migration to the Americas is thus unclear (see also American cheetah). Its habitat is lowland brush areas close to a source of running water. It occasionally inhabits dense tropical areas as well. It is crepuscular and nocturnal depending on location. This cat is comfortable in trees, but prefers to hunt on the ground. It preys upon fish, small mammals, reptiles and birds. The litter consists of one to four kittens. They are raised socially after a 70-day gestation. The kittens become mature at approximately 2 years of age. What is your favorite wild cat?